When an emergency occurs and employees need to go on leave, it can disrupt the process in the workplace. 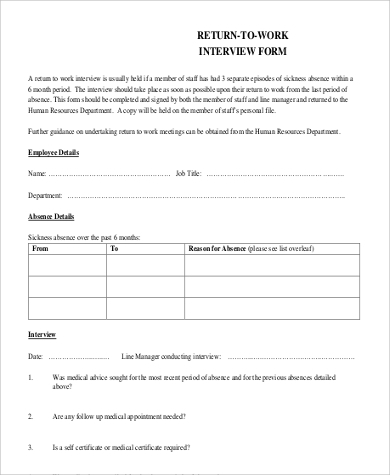 It’s best for a company to be thoroughly prepared and print the necessary forms ahead of time to be able to prepare and direct its employees by providing the forms they need to submit. 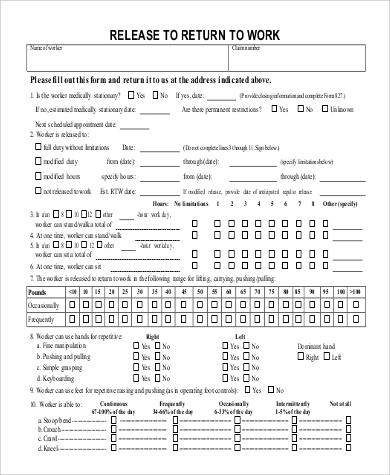 These Sample Return to Work (RTW) forms serve as a how-to guide and are ready-made for companies to print on and distribute to their employees. It covers everything from medical leaves to certifications on being fit to work and available for download either through Microsoft Word or Adobe Acrobat PDF file in these Sample Forms. 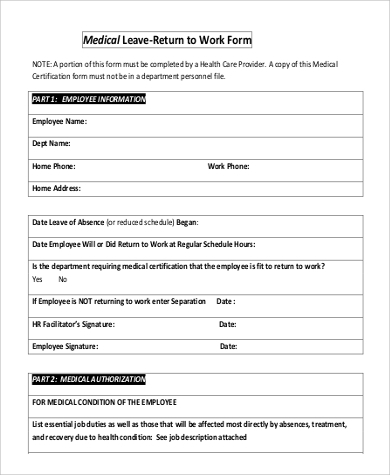 Includes date on the Leave of Absence and the possible date when the employee intends to go back to work, also including a space if and when the employee cannot return to work anymore with the corresponding medical condition. 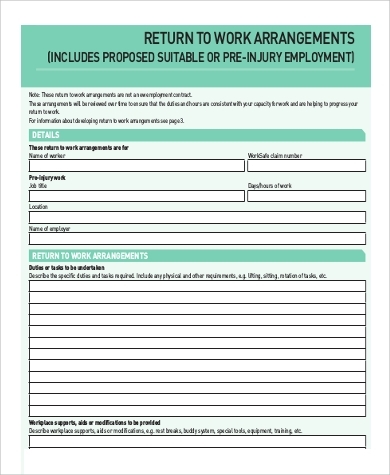 Includes elaborate details of the worker’s condition plus the physical capacity with which he or she may be able to handle; this to gauge the worker’s condition so that no further injury will result when the employee starts working again. Intended for the Human Resources Office employee file. 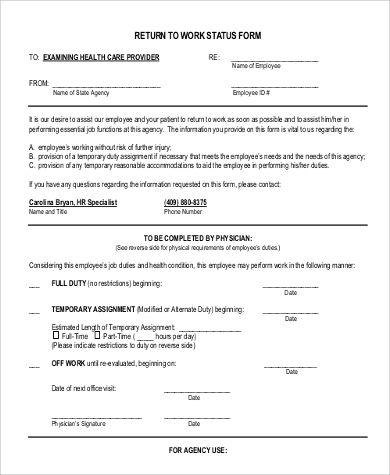 A space is given for the health care provider to fill up to include the necessary information on the worker’s condition and possible restrictions to physical functions. 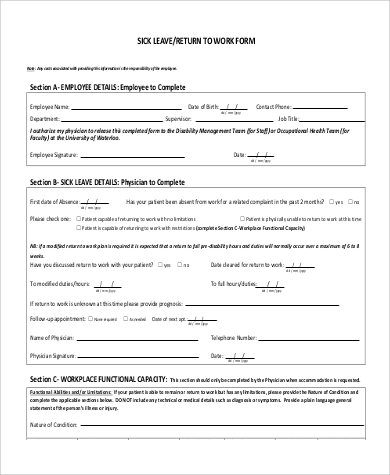 A detailed form that’s essentially a Medical Certificate to be filled up by the employee’s health care provider. A space is provided for either restricted or full duty with corresponding physical capacity on the type of work allowed. 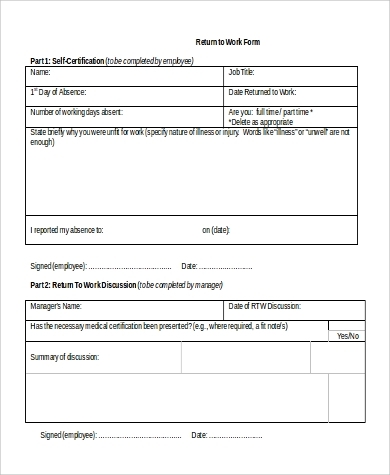 Here are Sample Work Release Forms that can be used further as guides to make forms for easy reference. Oftentimes, the company needs to address the health care provider to ask if and when the employee can return to work so as not to disrupt the workflow. 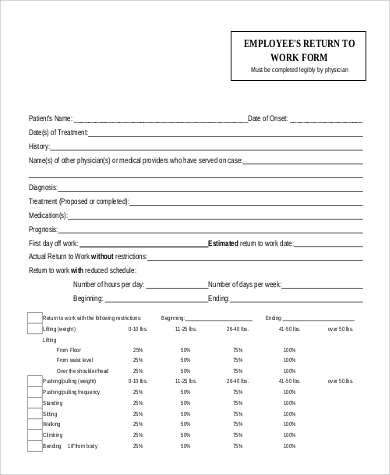 Forms such as Return to Work Status need a corresponding health care provider to give details and a Physician Release to Return to Work has to be produced to confirm that the employee has recovered and is fit to work. 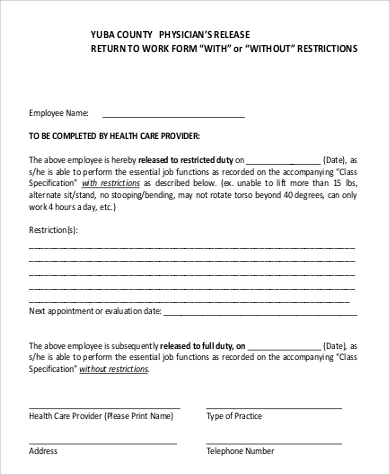 Here are a few more Return to Work Medical Forms that can be downloaded and used by the employer.